Jean is a old order Mennonite woman from New York state. 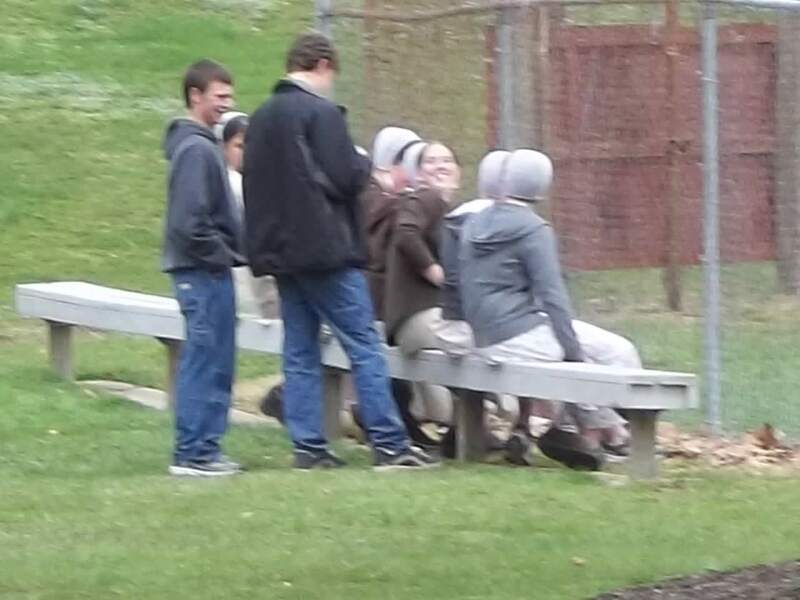 She shares her stories exclusively on Amish Stories. Hello everyone, I am back to continue about the Farmers Market. At 5:00 AM the van comes to our home to pick up the baked goods, my mother (or mother-in-law) and sometimes Susan. The back seats of the van go down and David slides in the wooden shelves that fit into the back of the van. David made these shelves-each one has a ridge so that I can put in pies, containers of cookies, etc. so they don’t slide out. Every time our driver lady gets a new van David has to make different shelves to fit the new van-one van never seem to be the exact same size as the previous van-even if it is the same make and model. In between the shelves we put in the items that do not fit on the shelves. From our house, the van goes to my mothers house, mother-in-laws house, and both grandparents houses. Everything is loaded in the van and off we go. We arrive at the market at 5:30, cover the table, and set out our baked goods. There is an Old Order Mennonite couple next to us and he gets another gentleman to slide the shelves out. We set the shelves up behind the table where customers can see what is on them. They shelves has sort of legs that slide down so they will stand. When David is there he and the man next door slide the shelves out. Even before we are set up some other people, that are set up, come to us for cookies, donuts, and more with their morning coffee. 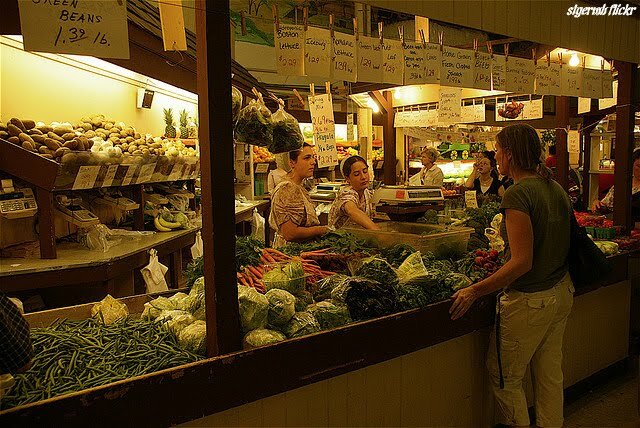 Once the Farmers Market opens at 6:00 AM we are flooded with customers. We get more customers on Saturday than Friday, but we are busy both days. At the opening of the day most of the people are regular customers that come in every week or month. We have gotten to know them and they know us. Also, we know, that certain people like certain goods, so we try to make sure we have them. We have a cash box that we make change at. Also , whoever is with me and myself have a money purse (money belt) hooked around our waist. One time, when David was there, he and I were busy with customers and someone took the cash box. We did not see who took it or the cash box again. Now, we wear the purses and after the cash box looks like it has a a lot of paper money , we put some in our money purse. If someone gives us a large bill-$20.00 or $50.00-it goes into our money purse and we make change out of the cash box. More than once whoever is with me and myself have caught someone’s hand reaching toward the cash box. We tried putting the cash box on the back table, but if we turn out back to make change people sometimes steal the baked goods. We don’t have much room so there is no place for a middle table-so the money purse has worked out very well. Most people are very nice, wait their turn, and would never think of stealing. It’s the few not so nice people that we have to watch for and the worse thing is if someone had a need and asked for some money-we would probably give it to them. We wouldn’t make them prove the need-we trust in the Lord. If they are taking money from us that is not theirs that is also between them and the Lord. We both bring our lunch with us so about 11:00 ones of us eats lunch and the eats at 1:00 or later. If customers are slow, we both eat at the same time. Also when customers slow down one usually takes a walk around the market to see what others have for sale and to get some exercise. We don’t go to far from our area because we never know when we will have to return to our tables fast-sometimes buses of customers come in. In the Finger Lakes tourists come from all over. Many of them would like to take our pictures. Even when we ask them not to-they do. Some of them are nervous around us and stare, but do not come close. Others come and ask us questions, most of which we are glad to answer. When David is there, they would rather talk to him than to me-which is fine. But of course there are some who are rude. 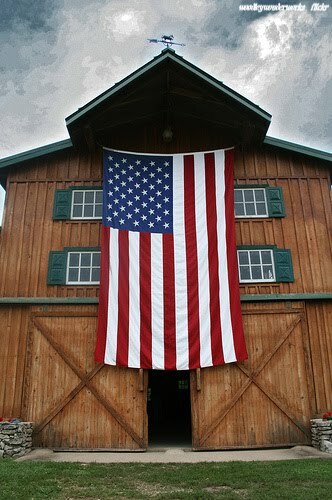 They ask why we don’t fly the American Flag. That we should go back to where we came from because we do not respect this country and do not deserve to live here. That we should live in the current century and stop dressing and acting the way we do. 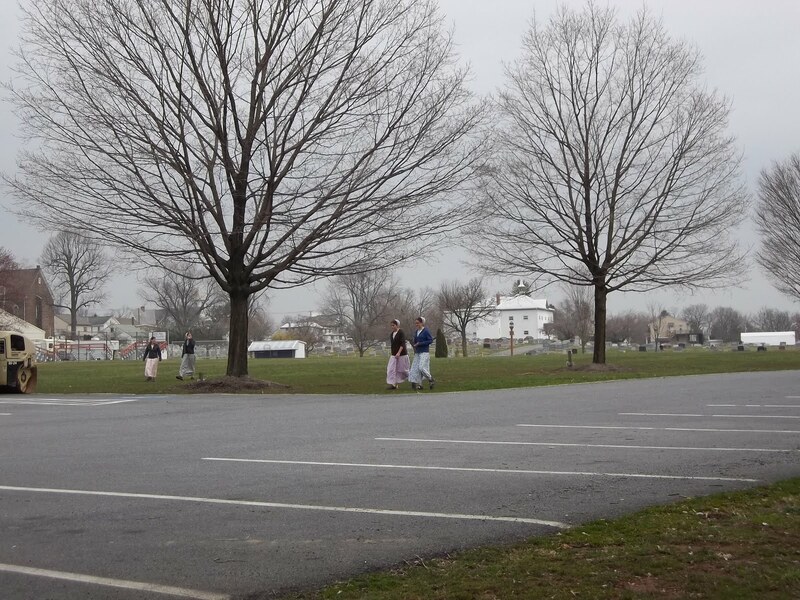 Some people believe that we are not Old Order Mennonite, but dressed like them-actors-to draw tourists. People want their pictures with us. Some try to talk us down on our prices. Some are just rude. Thank heavens there are very few of these rude people. If David is there, he handles them. When he is not there we try to be as tactful and as kind as we can be. 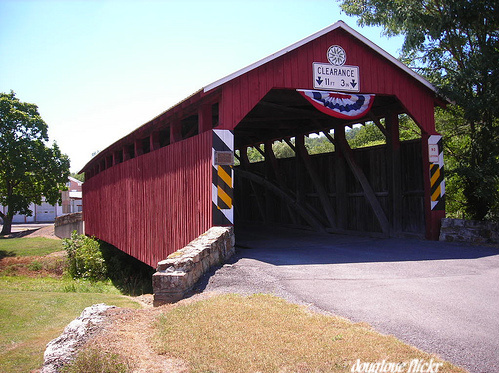 Yes, we have been out of New York State to the Lancaster, Ohio and more areas to weddings, funerals, etc. Usually we go by van, bus or train-we are not allowed to fly except in an emergency. We try to avoid tourists areas when we are there. Yes, we are glad that we do not live in a big tourists area like they are. In the Finger Lakes we deal with tourists at the Famers Market and sometimes at our home stand in front of our house, but we do have anywhere near as they do in Lancaster. When a day is finished at the Farmers Market, we go home to our quiet farm. At our home stand, we are usually glad to have tourists. We like to find out where they came from, where they are going-how they found us in our area because we are way out in the country. You have to take six different roads to get to our farm. Of course there are good people and not so nice people. I guess I have told you mostly about the markets and how we live. If you have any questions, please ask. 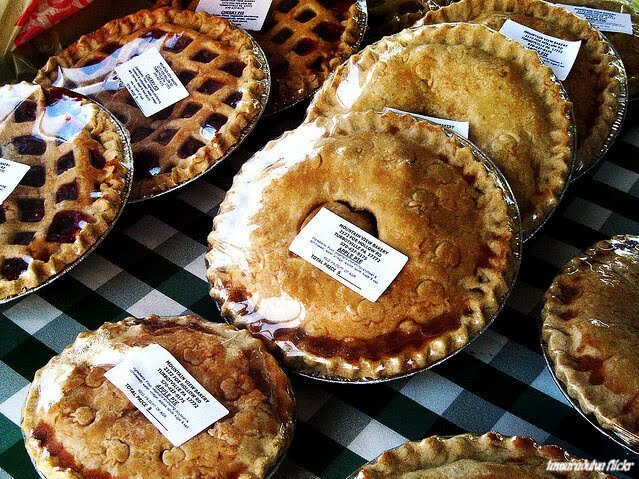 Due to this is planting season, Farmers Markets time, plus we also set up and sell baked goods and sometimes vegetables, jellies, jams, fruit and more on some special village Saturdays like Gorham weekend, Rushville weekend and more-I am not able to make or bake a special items. I hope you understand. When the fall comes and harvesting is done, I may be able to, but I just don’t have the time at this time-I hope you understand. I did ask our Bishop, last Sunday, and he told me I could not make prayer kapps for someone outside Old Order Mennonite. 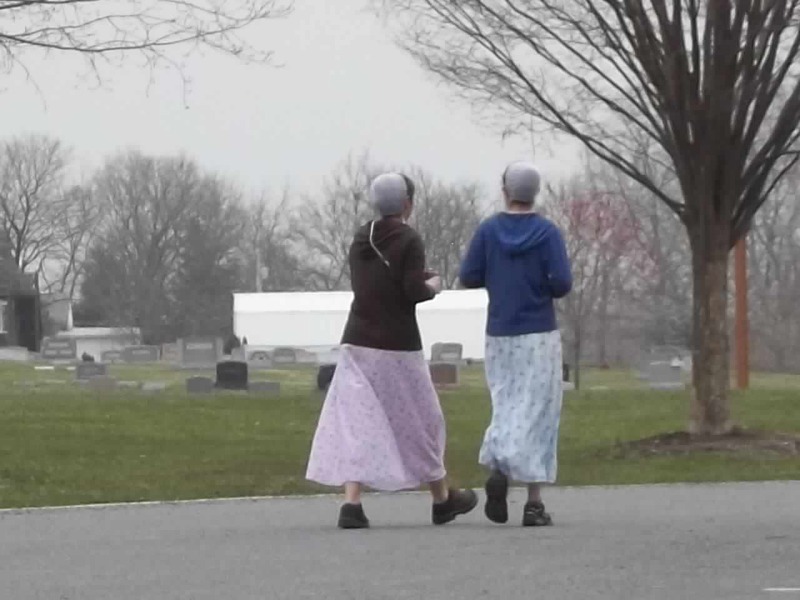 If you live near Old Order Mennonite or Amish you may be able to buy some prayer kapps at yard sales. Again, I hope you understand. Our prayer kapps are a little smaller than our bonnets-so that the bonnets will fit over the kapps. Our prayer kapps are white, light weight and starched. Yes, we do have pets. As we live in the country people leave their unwanted pets in our area. We have seen people leave them from their cars in front of our houses. Early on David and I decided we would not have a dog. Many of the kittens and cars that have been left in our area are in our barn-but we thought we had no need for a dog. Usually when dogs are left in front of our house we call the dog patrol. This particular one the dog patrol could not catch. He would sit on the edge of the road, stare at out house, but when the dog patrol came would run off. David tried to catch it by putting food out. The food would be gone, but we couldn’t catch the dog. One day I let Susan out in the back yard playing-she was about three, I was in the kitchen and could see her. I turned away for a minute and turned back she was gone. As I ran out of the house I called David from the barn, we saw her down by the road with the dog. The dog would not move as we yelled at him. From where we were it looked like the dog was biting Susan. David grabbed a board to get the dog away from her. He ran faster than I did and he realized the dog was not biting her but was standing between her and the road trying to keep her from going out in the road. I grabbed Susan and David tried to grab the dog, but off it ran. After much feeding and slowly walking closer day after day-it finally came in our yard. A few days after that it came to us. In became our pet. We washed it and took it to the vet in the buggy ( Bad mistake. He loves to ride in the buggy) and found out this big dog was yet a puppy and still had more growing. That was three years ago. The dog is big but as harmless as they come. When our regular gas reading man is on vacation-I have to take the dog inside because any fill in is afraid of him because of his size. People that don’t know us and pull in the drive way think twice when they see him coming. He is suppose to herd the cows in the barn but David says he mostly chases the cows not herd them. 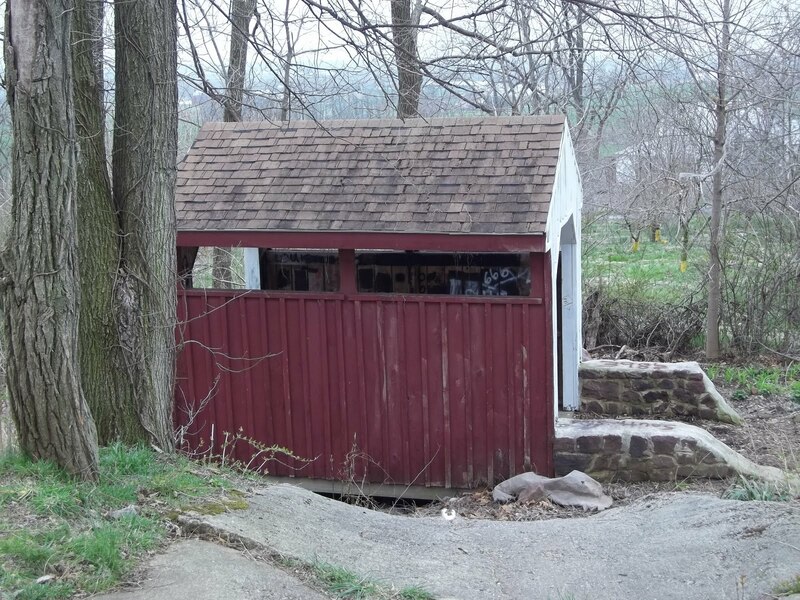 Yes, we do speak Pennsylvania Dutch. It is a bit different is some phrases, but mostly alike. We speak it all the time except when we are among people who do not speak it-then we speak English. Although Susan knows some English when she starts school-that is all they speak so we will have to be using English more in our home. 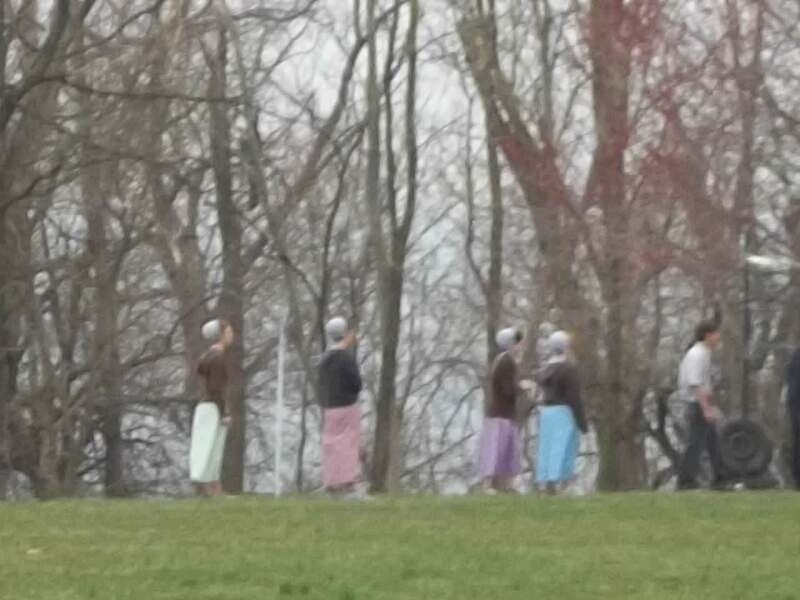 We have some Amish that have moved in our area and if what we heard is correct more are moving in. Yes, we are friends with them. In a way it is a bit funny. 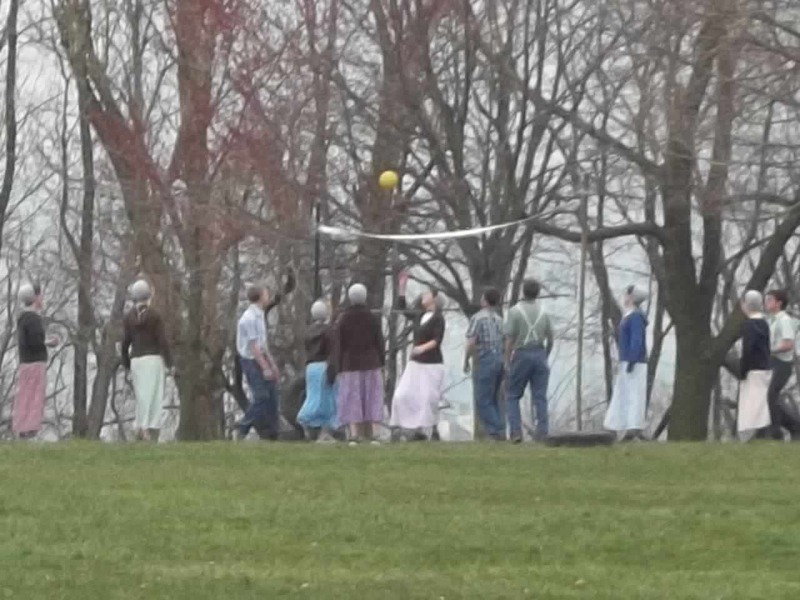 Most areas the Amish out number the Old Order Mennonites-in this area the Old Order Mennonites out number the Amish almost 100 to one. We all help each other when in need. Well this is it for this week. Please keep asking questions. 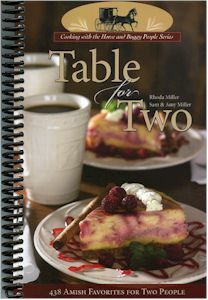 Table for Two sets the table with all the Amish food favorites–just for two! Sam and Amy Miller and their extended family have shared 438 of their best recipes in helpings that won’t leave a week of leftovers if there are only two at your house. Mouthwatering food, for just the two of you. Laminated cover – Spiral bound – 207 pages. Table for Two. To order this book please see our friends at http://www.amishshop.com/. Richard from Amish Stories. 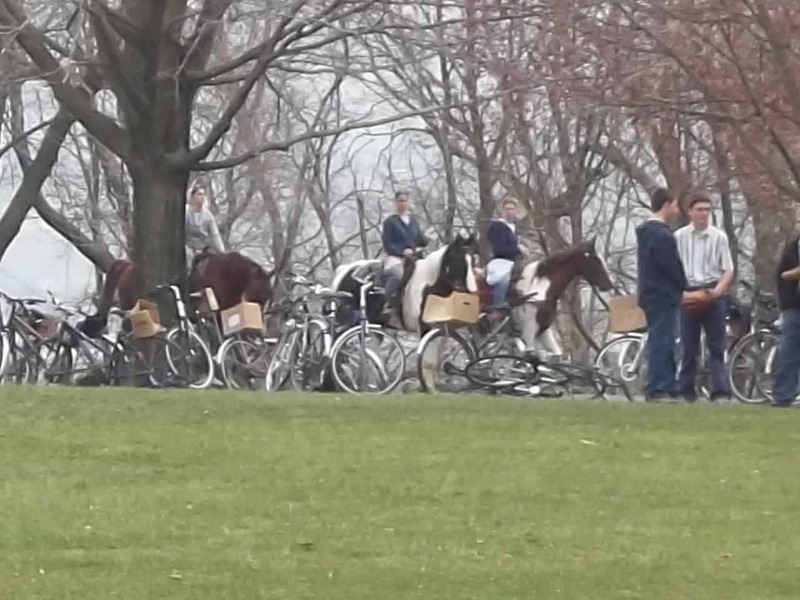 Some young old order Mennonites on horse back riding into the park. 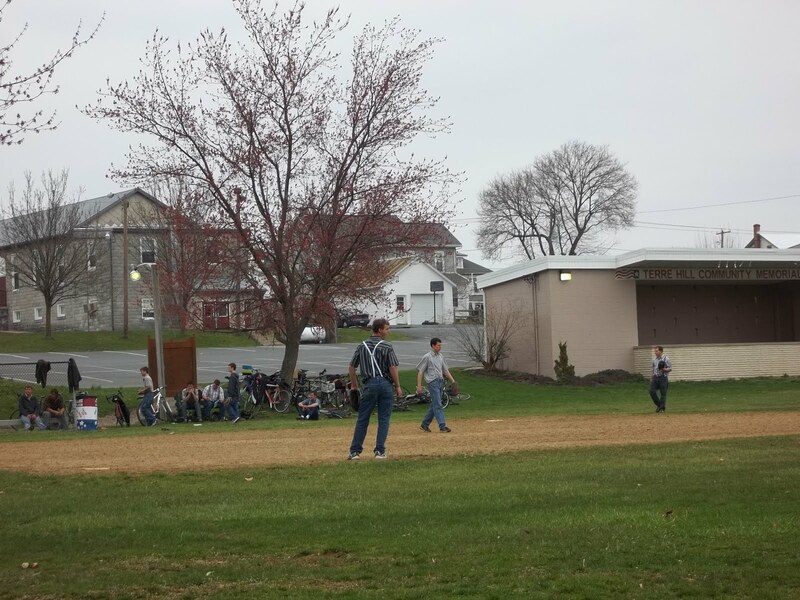 Young Mennonite teenagers were playing baseball on this early Sunday afternoon. 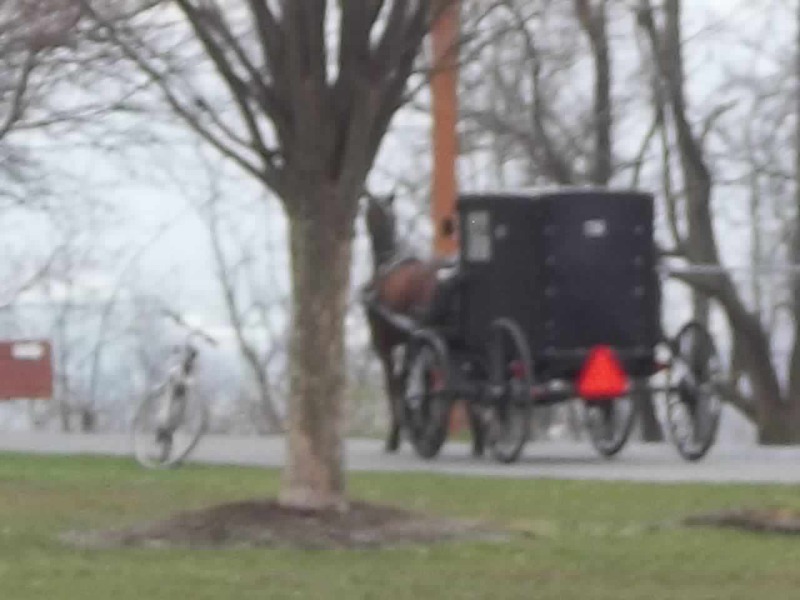 I posted the image of the old order buggy in the post before this one, so in this image which ill admit is slightly out of focus the buggy had just entered the park.I was really caught off guard to be honest with my camera being off and by my side. So that explains the out of focus shot of that buggy. 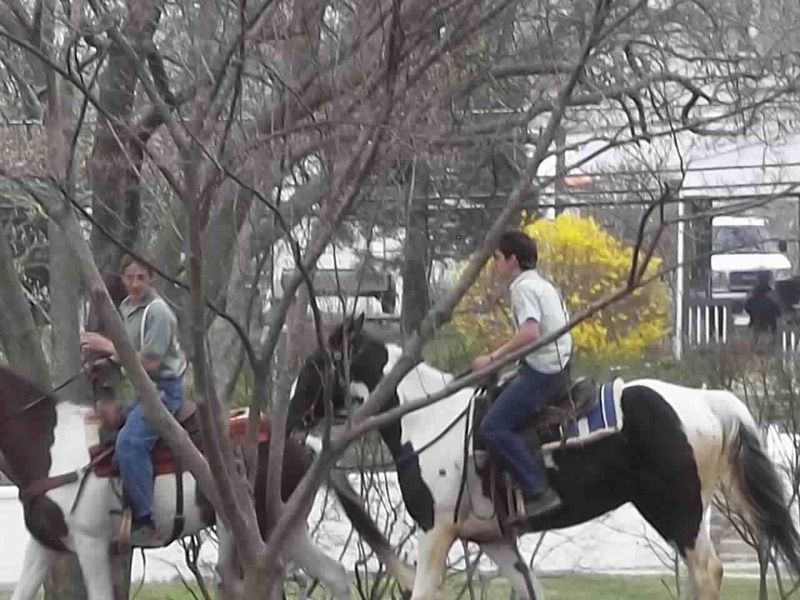 I was not about to be caught off guard again with these images of old order Mennonite teens riding on horses through this park. This may not be something seen very much so I’m really glad i was able to get my act together and capture these pictures.This park has become one of my favorite places to visit from my home, its extremely clean and really perfect in everyway. The town where this park is located is very non-tourist like so its a sleeper, and i mean that in a very good way. I wont mention the name of the town because i don’t want to be part of adding more people going to it, and i know the locals love it that way . The owner of the store which is the only small market in town told me that “when the young become old enough they move away for more excitement, only to be replaced with older folks seeking the peace and quite from the cities that they came from”. Something tells me that some of those young folks who have left will return one day, and maybe will seek something that’s always been there right in front of them. Maybe they were just too much in a hurry to leave, to have ever seen it. Richard from Amish Stories. Our laundry is drying really well on the lines outside. The sun is shining but it looks cloudy towards the west. I am later at getting this column written but I couldn’t relax and sit down until the laundry was done. With the sun and the wind daughter Elizabeth is bringing in some of the dry clothes already. We are hoping everything will be dry before the rain. We had a thunderstorm last night. Our neighbor lady said someone had spotted a tornado not too far from here. It missed us but sure makes us thinks of the ones not so lucky. Our thoughts and prayers are with all the people who have been affected. Meanwhile, this week we want to start washing walls and ceilings, cleaning out our cabinets and drawers, and so forth. I would like to get a head start on cleaning for church services that will be held here at our home in 4 weeks. Our thoughts linger to a year ago when we received the shocking news of the death of Emma and Jacob’s sweet little daughter Marilyn (who was my niece). It just seemed that it couldn’t have been true that she could be gone after her 8 short months here on earth. She is still so dearly missed but God has a reason for this, like he does for everything. And May 20 marked 11 years since my Dad passed away. The years go on by, but our memories of him stay with us forever. Emma, Jacob, and family came here on Friday evening in honor of my 40th birthday which was Sunday, May 22. My husband Joe grilled chicken and made hot wings out on the grill. Along with that we had mashed potatoes, gravy, corn, cheese, ice cream and a homemade rhubarb torte (see last week’s column for the recipe). Saturday evening my friend Ruth brought pizza and ice cream cake for my birthday, what a treat. Sunday we attended church at our neighbors. It was a large attendance with families visiting from other church districts. While we were eating lunch I was given a piece of cake with a candle on it. Everyone began to sing “Happy Birthday” to me. Another lady there, Marie, also had a birthday and they sang to her as well. I am glad I wasn’t having my 63rd birthday like she was, 40 seems old enough for me. Sunday evening I was surprised again when pizza was delivered for supper. Thanks goes to my editor Kevin for that. I told my husband Joe that it took three birthday suppers for my 40th birthday! Everything was greatly appreciated. It means a lot to not have to cook a meal when you are used to preparing three meals a day. We are enjoying lettuce and radishes out of the garden. It has still been very wet and I don’t have tomatoes, peppers, or cabbage out yet. Joe doesn’t have work next week so he will be home to help. He hopes to get caught up with the outside work before church services are held here. The hay is also growing with all the rain we have had. Another thing Joe wants to crowd in is to go fishing. Bass season opens on Saturday and he would like to give it a try. It is now after lunch and we have moved all clothes that aren’t dry yet on to the porch line where they will be protected from the rain. We have been having small thunderstorms every once in awhile this afternoon. A reader from Hamilton. Indiana sent me this cherry-rhubarb coffeecake recipe which I’d like to try. I will share it with you all. The recipe has three separate parts: the filling, the cake and the topping. Preheat oven to 350. In a saucepan cook rhubarb and lemon juice over medium-low heat for five minutes, stirring often to prevent burning. In a separate small bowl, combine sugar and cornstarch and then add to rhubarb mixture. Cook and stir 5 minutes more until thick and bubbly. Remove rhubarb mixture from heat, stir in pie filling and set aside to cool. For the cake, in a large mixing bowl combine flour, sugar, baking powder, baking soda, and salt. Cut in butter until the mixture resembles fine crumbs. In a separate mixing bowl beat buttermilk, eggs, and vanilla. Add to flour mixture. Stir just until moistened. Spread a little more than half of the batter into greased 9 X 13-inch baking pan. Spread cooled filling over batter. Drop remaining batter by teaspoon onto filling. For topping combine sugar and flour. Cut in butter until mixture forms coarse crumbs. Sprinkle over batter. Bake at 350 for 40 to 45 minutes. 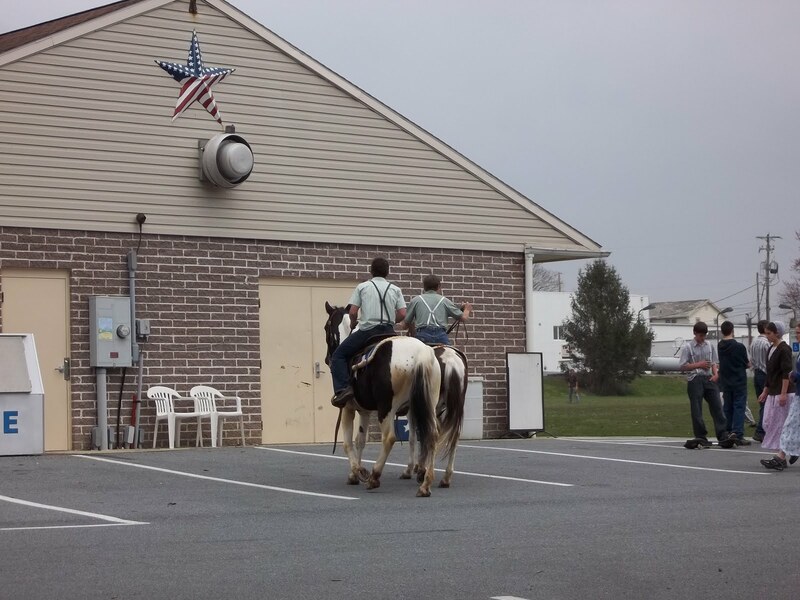 Old order Mennonite community in Lancaster county. On what was a very quite day in a park located in the northern Lancaster area. There was lots of activity on this day in what is mainly a old order Mennonite community. 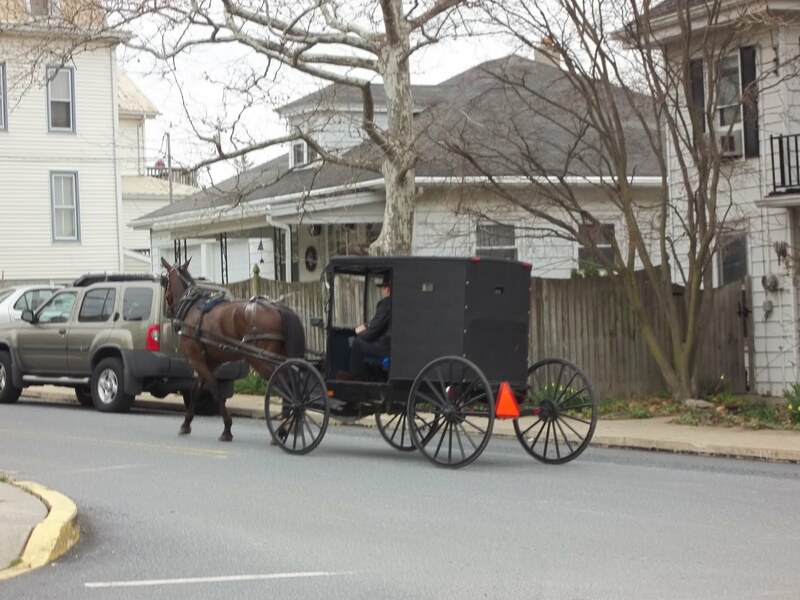 In this small town in north Lancaster, you will find old order Mennonites living pretty much side by side with the Amish. 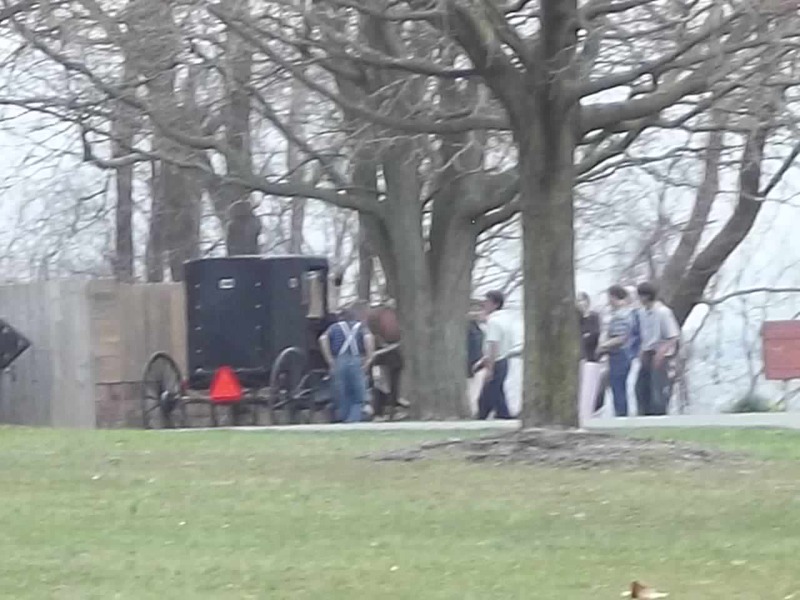 The buggy that is seen in the third image down had just entered the park as some young Mennonites gathered around it to chat with each other. If i could sum-up one word for this day, i would have to say “controlled fun”. 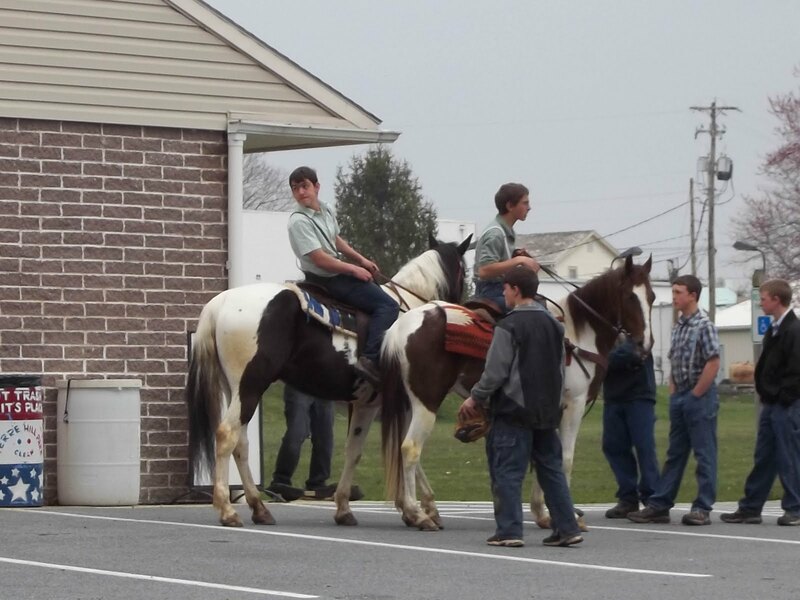 All these young Mennonites were very polite with none of the mischief that is typical with others their age. Lets say i was very impressed and pleased at what i had seen on this day with these young people, and i would say to their parents “a job well done”. Jeans post for May 24. Jean is a old order Mennonite woman from New York state. 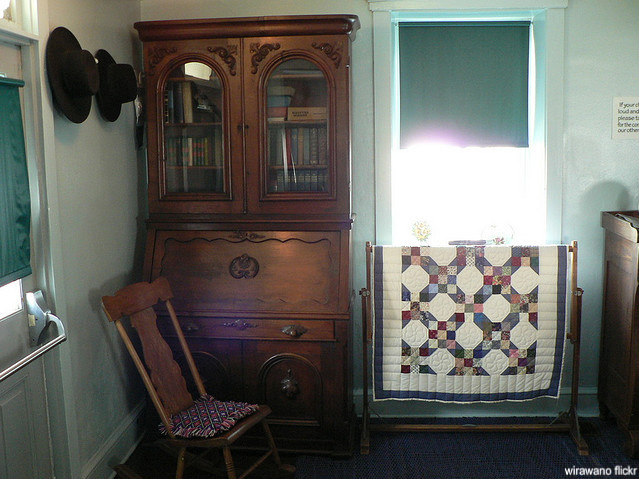 She shares her personal accounts on being Old order Mennonite only on Amish Stories. Please comment and leave Jean a question. Hope everyone is enjoying this beautiful spring season. Richard has asked to tell you about getting prepared for a bake sale at the Farmers Market. My husband David, started this as he thinks all us ladies do is really like an assembly line. You all asked what I do dailey so I am going to try to put them together. David and I wake up at 5:00 AM. Before we rise we like to start our day with morning prayer. Maybe he will read a scripture and we pray. If something or someone has been bothering one of during our sleep we pray for that person or situation. (We do this if Baby David doesn’t wake us-if he does – he gets my immediate attention and we try to do this later in the day). After prayer I go down and put on the pot of coffee while David gets dressed, shaves (our men do not have beards or mustach). When he is dressed we try to get in a cup of coffee together before he goes milking the cows. (Again, Baby David can change this.) When David goes to the barn for milking I go upstairs, get dressed and get Susan our of bed as she is a hard sleeper-nothing wakes her up. She gets dressed and goes out to get the morning eggs. I take care of Baby David, bathing, dressing, feeding, etc. I then go downstairs to start breakfast. You ask what we have for meals. Just an average breakfast is: a small bowl of oatmeal, either waffles, pancakes or french toast, either bacon, sausage, or ham, glass of juice or a dish of fruit or berries (if in season), sweet rolls if some are made, coffee. We make our own maple syrup from the trees on our property. Sometimes instead of what I previously said we have eggs or omlets, bacon, ham or sausage, potatoes, toast (or rolls) , oatmeal, and juice or fruit. I also make the jams and jellies that go on the rolls or toast. On Sunday mornings we sometimes have a quick cereal, juice, rolls, etc. We always say a brief, silent prayer before and after we eat any meal. If it is Monday, Wednesday or Saturday I try to put on a load of wash while David is still in the barn. After breakfast Susan and I clean up the dishes. I hang the first load of wash on the line. Susan and I them go through the house looking for items that need washing, straightening, dusting or sweeping. Once all the clothes are on the line and the house cleaned – I check to see if I have enough baking products for this Farmers Market. I also start baking for our home-pies, cakes, cookies, bread, rolls, etc. It seems like I am doing this every day, as they are gone almost as fast as I bake them. If I am having soup or salads for lunch, I start them. Susan helps as much as she can for her age. During the morning, she also goes out and feeds the chickens. On Monday, about 10:00, my mother-in-law, mother, and sometimes by grandmother and David’s grandmother come over. We have coffee or tea and whatever baked goods I have baked already and discuss what who is going to bake for the Farmers Market. Sometimes one of the ladies calls before coming and tells me she is bringing the treat (baked goods) with her. We also discuss how much of each item we are making. Also, we discuss who needs baking products, how much and whose husband is going to take them (in the buggy) to get the products (usually David and myself-we’re the youngest). If someone else has to go into town for a doctors appointment, get farm tool, etc. -they get all the baking products. Susan is with us doing this “meeting”. She must learn all about this as she will be doing this when she gets older. If the grandmother’s are not there we call them and let them know what they are to bake-unless they would prefer to make something else. If they want to bake what someone else is baking we change things around. They get top choice what to bake. Sometimes one of them or both of them can’t bake – maybe cold weather, not feeling well, etc.-then we get my nieces or David’s nieces to fill in as baker. We also decide which-either my mother or mother-in-law will stay with Susan and baby David and who is going to the Farmers Market with me. The mothers usually switch every other week. Of course everyone plays with Susan and baby David before, after and during this gathering. At about 11:30, the ladies go home and I prepare lunch. Lunch could be salads, sandwitches, soup and a sandwitch, sandwitches and salads with a dish of fruit. If I make sandwitches it is 99% of the time on my home made bread. Only if I am sick or some emergency comes up do we use store purchased bread. Also are beet eggs, chow chow, pickels, etc-all home made. Before our meal David sometimes reads a short scripture and then we have silent prayer. If we are planting or harvesting and there are several workers there-we just have silent prayer before and after our meal. In between all the activities I have here, of course, I am feeding Baby David, putting him for his nap, changing him, etc. He is never forgotten or ignored. After his grandmothers have played with him and fussed over him on Monday-he needs a nap. We say they wear him out. I use to have Susan take an afternoon nap, but with her age and school starting in August, she must start staying up from morning until bedtime. If she is really tired, we let her, but we try so hard not to. After we have the dishes done, Susan and I play together, I read her stories (from the Bible), sometimes make a special baked good she likes, play games, etc. Later in the afternoon, I take down the laundry. Susan and I fold it and she puts her items in her room and baby David’s items in his while looking for any items that may have seams parting or might have hole that needs to be sewed. I take care of husband David’s and my clothes, sheets, towels, etc. Anything that needs to be ironed is done and put away. If it is Thursday, Susan and I start baking for the Farmers Market right after the breakfast dishes are done. We make the dough for the breads, rolls, etc. and let them rise while we make cookies. After a quick lunch, we bake the breads, and rolls. Supper is usually a caserole, salad, and cookies for desert during baking day. Once the dinner dishes are done, I make the pies, cakes, etc. while David plays with Susan and baby David. A usual dinner in our home (not on Thursday) is meat, vegetables, salad, rolls, homemade jelly or jams, potatoes, pickels, beet eggs, chow chow, etc. Sometimes we have stews, caseroles, soups and more. Of course we always have deserts such as baked goods or sometimes we make ice cream. During the evening we usually have some sort of a treat-popcorn, cookies, and so on. On Thursday, David, plays with the children in the evening while I continue baking. When my mother and I did the baking alone we baked all night-but with more bakers we don’t do that anymore. On Thursday I am done around 9:00 or 10:00. They are all wrapped, packed and ready for the driver (van) to pick us up the next morning at 5:00 AM. If we have items from the fields, while I am baking David is packing fruit, vegetables, etc. for him to bring and sell at the Farmers Market. In the fall after canning we sometimes take jams, jellies, chow chow, and alike. If this is not a bake day, David, the children and myself spend the evening, visitng or visitors come to us, playing games with the children, taking walks, reading, and more. I sometimes do sewing or making clothes in the evening. At 7:30, David, gets out the Bible, reads, after we pray. This lasts for about 15 minutes, then I put Susan to be at 8:00. David and I stay down together until 9:00 afer which we go to bed. I know I have left things out and it sounds like we are always working and not spending times with the children-but it is not. I have never told people what I did before and as I say I left things out. Sometimes, in the afternoon during the seasons are canning days, quilting days, visiting the sick or lonely, working on the house and more. 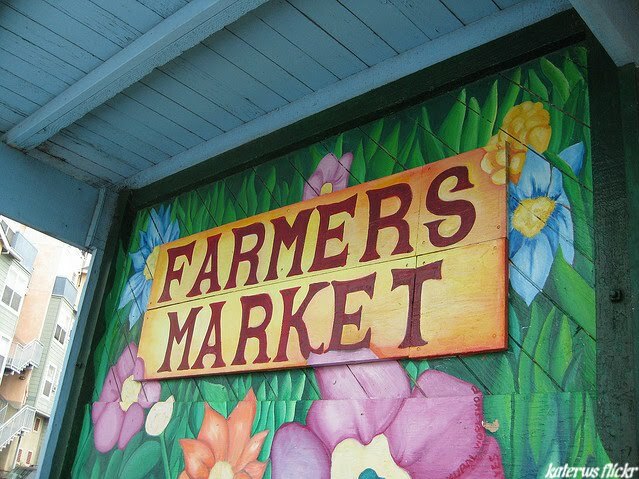 The Farmers Market is on Friday and Saturday. On Friday while I and either my mother or mother-in-law are at the market-the one who is home taking care of the children also starts baking again for the Saturday Farmers Market. She also fixes dinner. After we eat home, we bake into all hours of the morning to have baked goods for Saturday. If the Farmers Market falls on Monday like for Memorial Day, when we get home on Saturday, we bake for Monday and either store or freeze. We also get up at 12:01 AM on Monday morning and bake, pack the goods and are ready for our 5:00 AM van. We do not bake on Sunday-the Lord’s Day. Jean ………………………………………………………..Watch for Jeans next post on May31.